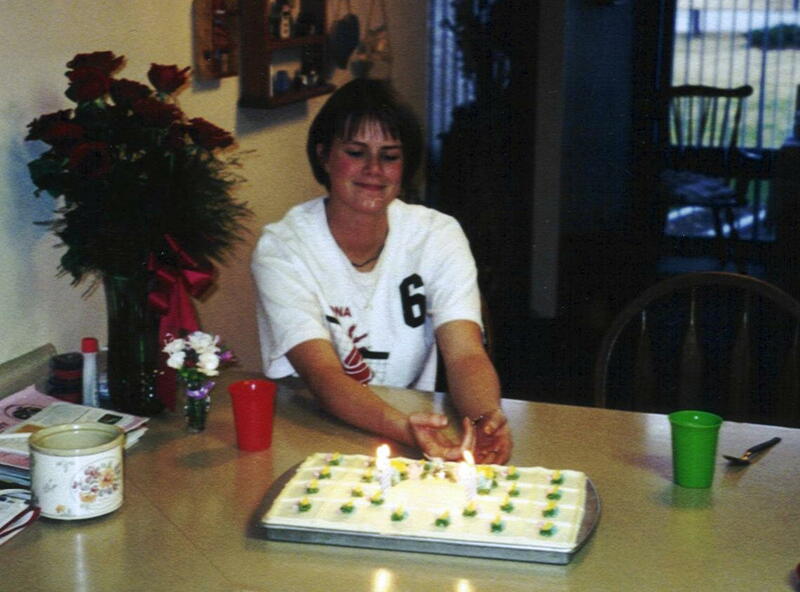 The year we first connected, on what would have been Kari’s 19th birthday, I received a “Happy Birthday to your Lungs!” card from Kari’s mom, Lisa, that included the above picture. Lisa said that it is one of her favorite pictures of Kari. It’s now one of mine too. 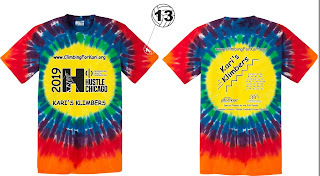 She also said that tie-dye was one of Kari’s favorite patterns. 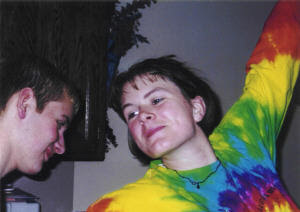 Several of Kari’s friends have echoed that to me – nudging me to do tie-dye shirts. But, the print on tie-dye shirts just never looked that great – and then there’s the cost! Well, we went there this year!!! And another reason is that these two, awesome, precious goofs are coming out to climb with me too!!! Kari’s niece and namesake, Eva Kari, and her nephew Garrett will be in the stairwells with me, along with their mom and dad – and Lisa will be at the top. Eva and Garrett were born long after I received Kari’s lungs. 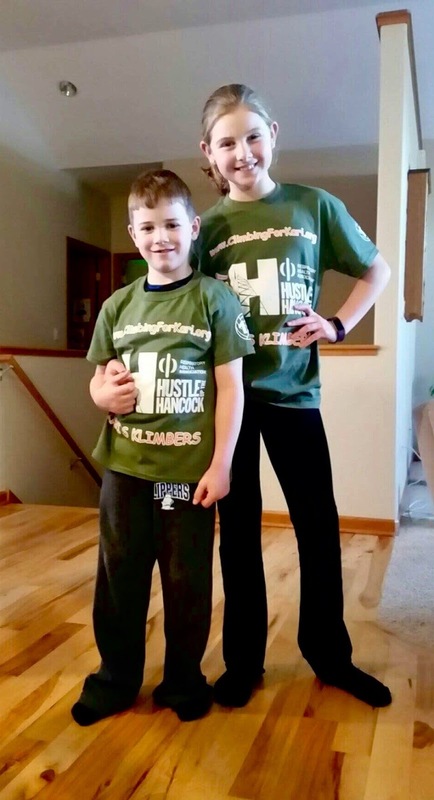 I’ve never met them, but I’ve watched them grow up (and pose with our team shirts) – and I’m very excited to meet them this coming weekend!!! I know that Kari would have absolutely ADORED Eva & Garrett!!! There are a 2 small flights of stairs leading up to the courtyard of our building. I remember the few years I waited - before receiving Kari’s beautiful gift - on the infrequent occasions where we would walk over to Blackie’s for breakfast, walking back, toting my oxygen, coming up to those stairs - it sometimes felt like I was coming up to Mount Everest. I would take 2-3 steps, then rest a few or several minutes, then take 2-3 more - slowly - until we got to the top. Sometimes we would dodge them, going into the garage to take the elevator one floor to the courtyard level. To dodge 2 small flights of stairs. I do this climb to tell people about Kari – and tell people about her goodness and the goodness of her family and friends – and I tell people about Alex and the importance of organ donation. And we also do this for people with crappy lungs, like I had. RHAMC helps people breathe easier – they fund research in lung disease – they help people stop smoking – they help people with lung cancer, pulmonary fibrosis, cystic fibrosis, COPD, asthma and other respiratory diseases live longer, easier lives. One of RHAMC’s mottos has been, “If you can’t breathe, nothing else matters…” I lived through that motto, and I know too many people living it now. The RHAMC and all of these crazy people who climb with me, and you, help people breathe. We have a very special mission. Our cause touched Laura and me another way 3 years ago... My beautiful mom-in-law was diagnosed with lung cancer in fall of 2015. 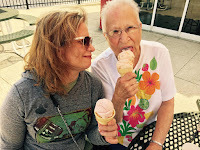 Much to my Laura's dismay, moms and I were partners in mischief and finding the wrong foods to eat, particularly doughnuts. When she was diagnosed with lung cancer, mom and I had some long chats about options, and the strength it sometimes takes not to fight. She chose to fight. Ironically - the chemo had dramatically shrunk her tumors - it worked. But it was too toxic for the rest of mom and she didn't survive. We do this to fund research so maybe next time - someone else's mom-in-law has a better chance of hanging around and sneaking doughnuts with them. 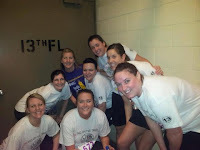 At 8:00am on Thursday, November 1st, the registration link will be active at www.RespHealth.org (new, but www.LungChicago.org will still redirect...) Choose to join the full climb, and to join a team, and pick Kari's Klimbers!!! There’s a few flights of stairs leading up to the courtyard of our building. I remember the few years I waited - before receiving Kari’s beautiful gift - on the infrequent occasions where we would walk over to Blackie’s for breakfast, walking back, toting my oxygen, coming up to those stairs - it sometimes felt like I was coming up to Mount Everest. I would take 2-3 steps, then rest a few or several minutes, then take 2-3 more - slowly - until we got to the top. Sometimes we would dodge them, going into the garage to take the elevator one floor to the courtyard level. To dodge a few flights of stairs. Several times every week I’ll pause and look around at the brightness or gloom, at the sun or rain, in the heat or cold - and it will dawn on me how lucky I am - and I’ll think about the gifts I’ve been given - and often I’ll tremble a bit, and my eyes will well up when I think about Kari and her family, about Alex, and about the medical folks and family and friends who helped me through some seriously crazy $hit. And I’ll think about the friends who surround and support me now. I also think about the organizations that have helped me stay on this planet - and help me and others stay her a little more comfortably, and a little longer. The Respiratory Health Association, The Cystic Fibrosis Foundation, so many others... This is always one of my opportunities to pay some of that back - or forward. All is well with me – I’m breathing and peeing like a racehorse. My beautiful lungs have been performing between 110-120% of expected for my age for the past several years. Can you imagine going from 10-15% to 120%??? And since Alex gave it to me, my kidney function has been better than it’s been in the past 30+ years! And my Alex is doing awesomely with her one kidney, and her Matt, and their two beautiful little boys, Eli and Noah!!! 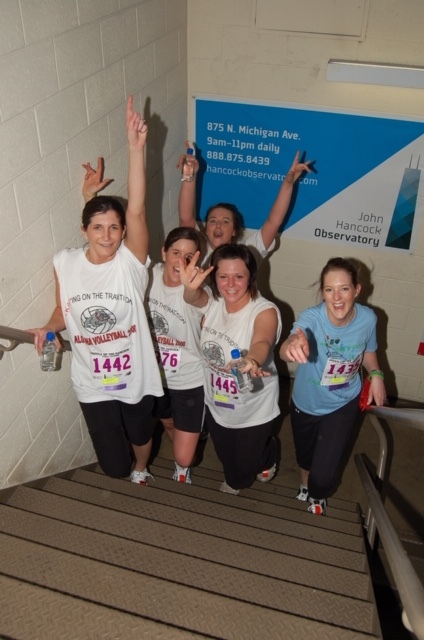 It’s that time of year again… Registration for the 2019 climb is about less than a month away – Registration is on Thursday, November 1st at 8:00am SHARP!!! Over the years, the Hustle has often sold out in roughly an hour – be there on time! The last few years it did not sell out for several weeks – but that may have been a fluke. The climb will be on the last Sunday in February, 2019 – Sunday, February 24, 2019. Registration is the same as last year – $155. My www.ClimbingForKari.org website needs a little updating – but the links should be going to the right place soon. I will register early on October 15th to create our “Kari’s Klimbers” team (and commit to raising $1000) so that our team will be available to join at 8:00am on Thursday, November 1st and there are no delays in registration. DO NOT SIGN UP BEFORE 8:00AM ON THURSDAY, NOVEMBER 1st – if you do, you too will be committing to raise at least $1000. Registering at or after 8:00am on Wednesday, November 1st does not commit you to raising anything beyond your registration fee (though, I’m always grateful if you choose to do so!!!) Drop me a line if you’re interested in the Hustle this coming year – or just join our team on November 1st… I’ll send you a reminder with links to the registration page a few days before November 1st. Remember – the full climb usually sells out pretty quickly. Instructions for joining my team will be on my www.ClimbingForKari.org website… A direct link to the instruction page is HERE… There is a prior year’s step-by-step document on that page, as well as a link to retrieve your prior username and password that will speed your registration. And finally – if this is not your first climb, thank you so much for climbing with me in past years… I spoke about quitting a few times in the distant past – I’ve had things I wanted to focus on and this takes a lot of thought and energy (so much of which falls on Laura’s back!!!) But – this is what I do… And Kari’s friends also let me know that quitting didn’t seem to be an option for me. Some of you have climbed with me for fifteen years – some of you for several years. Almost every year I meet someone new who Kari grew up with, and they come out to remember her with me. And for some of you – well, I just met you, and this is crazy, but we’re climbing 94 floors soon – join us maybe?! Through these past seventeen years we’ve raised nearly $400,000 together – that freaking blows my mind… How many times have you been part of a team that has raised that much funding??? I haven’t either. And this has happened because of so many people like you helping me. Thank you. And more special than the money will ever mean to me – you’ve helped me build a little platform to tell the world about Kari, and about Alex, and the gifts they’ve given – and you’ve helped me tell so many others about organ donation. We’ve had so many organ & tissue recipients, and donor family members, and friends of donors on our team – and when I go places to speak about organ donation, people say, “You’re that guy who climbs 100 story buildings with your new lungs!!! And so many of them already know Kari’s smile, and her name – and that means everything to me. I would have never generated that much excitement alone – I would have never generated that much awareness without all of you. I walk to work. I walk around my beautiful city. I’m lucky enough to have a Fitbit that tells me I average 14,000-15,000 steps daily. Every day. And several times every week I’ll pause and look around at the brightness or gloom, at the sun or rain, in the heat or cold – and it will dawn on me how lucky I am – and I’ll think about the gifts I’ve been given – and often I’ll tremble a bit, and my eyes will well up when I think about Kari and her family, about Alex, and about the medical folks and family and friends who helped me through some seriously crazy $hit. And I’ll think about the friends who surround and support me now. I also think about the organizations that helped me stay on this planet – and help me and others stay here a little more comfortably, and a little longer. The Respiratory Health Association and so many other organizations – this is always one of my opportunities to pay some of that back – or forward. This climb really means an awful lot to me and I wouldn't miss it for the world. This will be the 16th time I strut my fanny up the steps at the Hancock and this is my team's 15th climb. 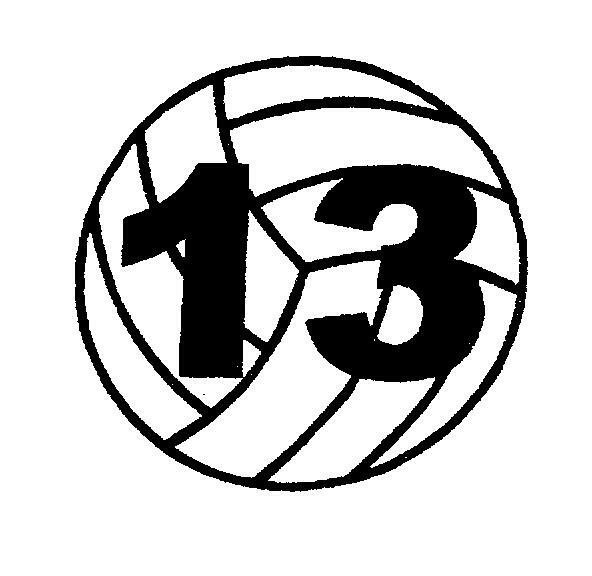 Kari was #13 on her high school volleyball team – And as they have for about 12 years now – her crazy, lovable teammates, #15, #12, #8, #7, #4 & #2 will be in the stairwells with me – along with several other people Kari grew up with – and 80+ people on my team. And, the kidney #7 gave me is working as awesomely as the lungs #13 gave me. I do this climb to tell people about Kari – and tell people about the goodness of her and her family and friends – and I tell people about Alex and the importance of organ donation. And we also do this for people with crappy lungs, like I had. RHAMC helps people breathe easier – they fund research in lung disease – they help people stop smoking – they help people with lung cancer, pulmonary fibrosis, cystic fibrosis, COPD, asthma and other respiratory diseases live longer, easier lives. One of RHAMC’s mottos has been, “If you can’t breathe, nothing else matters…” I lived through that motto, and I know too many people living it now. The RHAMC and all of these crazy people who climb with me, and you, help people breathe. We have a very special mission. Our cause touched Laura and me another way two years ago... My beautiful mom-in-law was diagnosed with lung cancer in fall of 2015. Much to my Laura's dismay, moms and I were partners in mischief and finding the wrong foods to eat, particularly doughnuts. When she was diagnosed with lung cancer, mom and I had some long chats about options, and the strength it sometimes takes not to fight. She chose to fight. Ironically - the chemo had dramatically shrunk her tumors - it worked. But it was too toxic for the rest of mom and she didn't survive. We do this to fund research so maybe next time - someone else's mom-in-law has a better chance of hanging around and sneaking doughnuts with them. 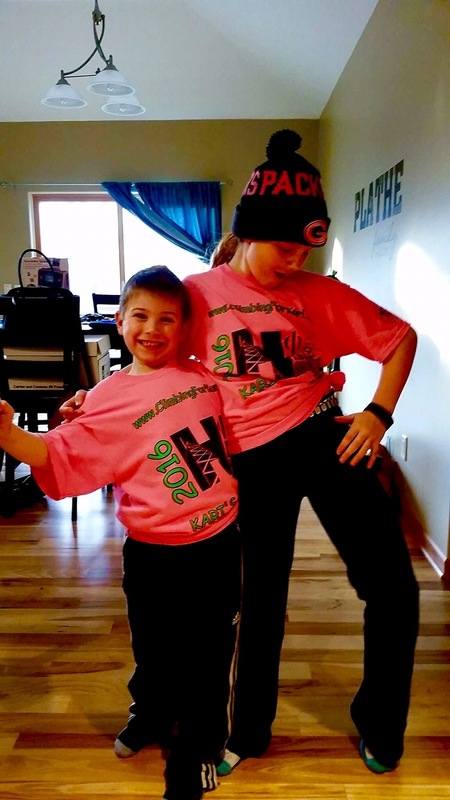 Kari’s Klimbers – 2018 Team Recruit Letter!!! It’s that time of year again… The 2018 climb is not yet sold out so, if you've ever thought you might want to take a crack at this, or if you've joined me before and want to do it again, registration for the 2018 climb is still a possibility!!! The climb will be on the last Sunday in February, 2018 – Sunday, February 25, 2018. Registration is the same as last year – $155. My www.ClimbingForKari.org website needs a little updating – but the links should be going to the right places now. I registered in October to create our “Kari’s Klimbers” team (and commit to raising $1000) so that our team was available to join at 8:00am on Thursday, November 1st - we currently have around 80 climbers and there is room for more! Registering and paying the $155 fee does not commit you to raising any additional funds beyond the registration fee, though, I’m always grateful if you choose to do so!!!) Drop me a line if you’re interested in the Hustle this coming year – or just follow the instructions below to register. Some of you have climbed with me for fifteen years – some of you for several years. Almost every year I meet someone new who Kari grew up with, and they come out to remember her with me. And for some of you – well, as Carly Rae Jepsen might suggest, I just met you, and this is crazy, but we’re climbing 94 floors soon – join us maybe?! Through these past sixteen years we’ve raised well over $300,000 together – that freaking blows my mind… How many times have you been part of a team that has raised that much funding??? I haven’t either. And this has happened because of so many people like you helping me. Thank you. And more special than the money will ever mean to me – you’ve helped me build a little platform to tell the world about Kari, and about Alex, and the gifts they’ve given – and you’ve helped me tell so many others about organ donation. 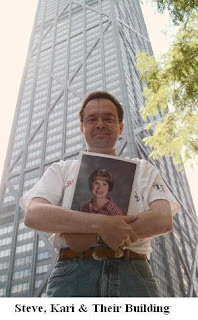 We’ve had so many organ and tissue recipients, and donor family members, and friends of donors on our team – and when I go places to speak about organ donation, people say, “You’re that guy who climbs 100 story buildings with your new lungs!!! And so many of them already know Kari’s smile, and her name – and that means everything to me. I would have never generated that much excitement alone – I would have never generated that much awareness without all of you. Registration begins at 8:00am CST on Thursday, November 1, 2018!!! Please be aware that it used to sell out within about 60 minutes, but the past few years it’s taken days – to play it safe, get there early! Note: This is a prior year's document -- but it still applies! You will be able to use your Username and Password from previous Hustle registrations, if you've been on my team before... If you don't remember what your Username and Password are - you may want to check out this link before November 1st. You can find your Username and/or reset your password by going to this link. 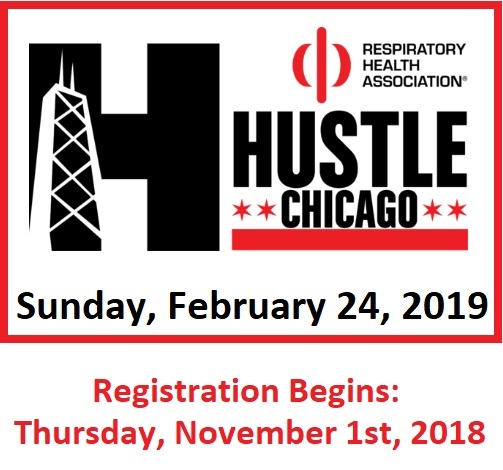 After clicking the button/link for regular Hustle registration available at www.LungChicago.org you will be directed to the Hustle registration page… Choose the “Full Climb” – on the page that follows, take the “Register to join an existing team” choice “Join a Team”… That will take you to a “Search for a Team” page – Enter “Kari” or some part of the “Kari’s Klimbers” team name and click “Search” – when “Kari’s Klimbers” pops up – click “Join this Team”… Then just follow the instructions to complete your registration. Please note: if you remember your username/password from your last registration - much of your data will be already be completed! The registration fee is the same price as last year – registration for the full climb is $155.00, the half-climb is $120.00. Monday, November 2 at 8:00am Sharp!!! The last few years it has sold out in about a half hour -- so be there early! I will create my team prior to November 2 by pledging to raise $1,000 -- and links to the registration page for my team will be here prior to November 2... 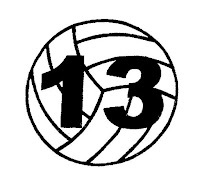 However, please do not attempt to register before 8:00am November 2 or you will be pledging to raise $1,000! You can click here for more Hustle 2010 information.